And though her family and friends don’t believe her, Gerry knows for certain that she is one. From morning to night, Gerry does everything that fairy princesses do: she dresses in royal attire and practices her flying skills, and she is always on the lookout for problems to solve. But it isn’t all pink and proper — as every real-life fairy princess knows, dirty fingernails and scabby knees are the price you pay for a perfect day! 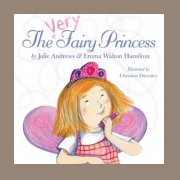 From the bestselling mother-daughter team Julie Andrews and Emma Walton Hamilton comes a joyful new story about believing in yourself and sharing your unique inner sparkle. Little, Brown Books for Young Readers. May, 2010.